Learn how to install Apache Giraph on an HDInsight cluster. The script action feature of HDInsight allows you to customize your cluster by running a bash script. Scripts can be used to customize clusters during and after cluster creation. Identifying potential friends based on your current relationships. Identifying the shortest route between two computers in a network. Calculating the page rank of webpages. Components provided with the HDInsight cluster are fully supported - Microsoft Support helps to isolate and resolve issues related to these components. Custom components, such as Giraph, receive commercially reasonable support to help you to further troubleshoot the issue. Microsoft Support may be able to resolving the issue. If not, you must consult open source communities where deep expertise for that technology is found. For example, there are many community sites that can be used, like: MSDN forum for HDInsight, https://stackoverflow.com. Also Apache projects have project sites on https://apache.org, for example: Hadoop. This section provides instructions on how to use the sample script while creating the cluster by using the Azure portal. You can also apply script actions to already running clusters. For more information, see Customize HDInsight clusters with Script Actions. Start creating a cluster by using the steps in Create Linux-based HDInsight clusters, but do not complete creation. WORKER: Leave this entry unchecked. ZOOKEEPER: Leave this entry unchecked. PARAMETERS: Leave this field blank. At the bottom of the Script Actions, use the Select button to save the configuration. Finally, use the Select button at the bottom of the Optional Configuration section to save the optional configuration information. Continue creating the cluster as described in Create Linux-based HDInsight clusters. How do I use Giraph in HDInsight? Once the cluster has been created, use the following steps to run the SimpleShortestPathsComputation example included with Giraph. This example uses the basic Pregel implementation for finding the shortest path between objects in a graph. 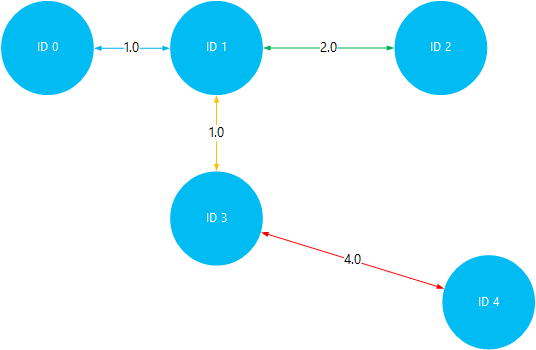 This data describes a relationship between objects in a directed graph, by using the format [source_id, source_value,[[dest_id], [edge_value],...]]. Each line represents a relationship between a source_id object and one or more dest_id objects. The edge_value can be thought of as the strength or distance of the connection between source_id and dest\_id. To save the file, use Ctrl+X, then Y, and finally Enter to accept the file name. jar The jar file containing the examples. org.apache.giraph.GiraphRunner The class used to start the examples. org.apache.giraph.examples.SimpleShortestPathsCoputation The example that is used. In this example, it computes the shortest path between ID 1 and all other IDs in the graph. -ca mapred.job.tracker The headnode for the cluster. -vif The input format to use for the input data. -vip The input data file. -vof The output format. In this example, ID and value as plain text. -w 2 The number of workers to use. In this example, 2. For more information on these, and other parameters used with Giraph samples, see the Giraph quickstart. The SimpleShortestPathComputation example is hard coded to start with object ID 1 and find the shortest path to other objects. The output is in the format of destination_id and distance. The distance is the value (or weight) of the edges traveled between object ID 1 and the target ID. Visualizing this data, you can verify the results by traveling the shortest paths between ID 1 and all other objects. The shortest path between ID 1 and ID 4 is 5. This value is the total distance between ID 1 and 3, and then ID 3 and 4. Install and use Hue on HDInsight clusters.